Baoti Pagoda was built thousand years ago on the Baoshishan (Gem Hill) which lies to the north of West Lake and separates it from the northern part of the City of Hangzhou. Baoti Pagoda is situated at the top of the hill when it was last rebuilt in 1933. 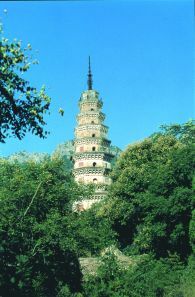 The current pagoda is made of black brick and has a rather unique style – mixed of traditional Chinese and Gothic style. It has 150 feet high and can be seen from almost any spot on West Lake. The whole area atop the hill had been part of a vast Buddhist temple and monastery.